For all the new players on this server, I will try to explain how to go about getting started from scratch. This guide will maybe not be for you if you have some technical knowledge or are familiar with installing software and patches. I'm writing this guide from a Windows 10 machine. I don't know how different everything is for Mac or any other Operating System, but I doubt it will be much different. If you came here looking for solutions to your technical problems, you can still read over this guide to see if you missed something. Let's skip the nonsense and get your character going! To log into the game you'll need an account. This step can also be done later, but I'll show you this first, because it's a vital part of getting access to the server! Make sure you write down your username and password. You will need this at the end of this guide! To play the game... any game, you'll need the basic game installed on your computer (or device). Let's go grab that game files! You can find all files at the download page. Windows users need to download the torrent file from that page. It's the first link on the page next to the Windows logo. Open the file in your preferred torrent program. There are numerous programs for that, but I suggest µ-torrent. You can find µ-torrent here if you haven't got it installed on your system already. 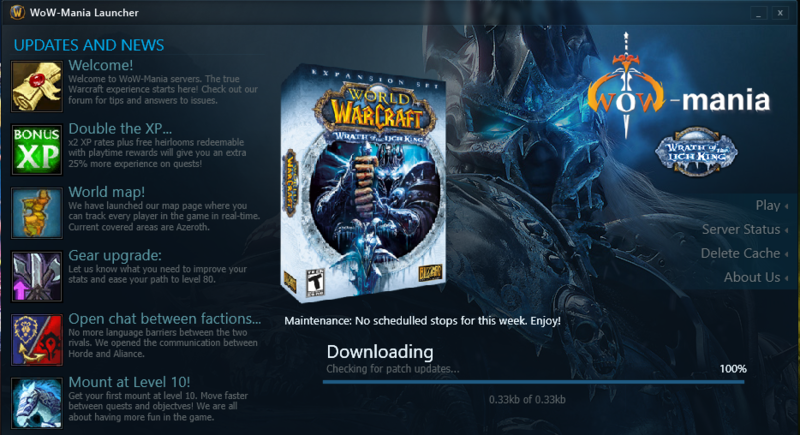 Downloading the WOW client files may take a bit, since it's a very large download, and speed depends on the bandwidth provided by your ISP. 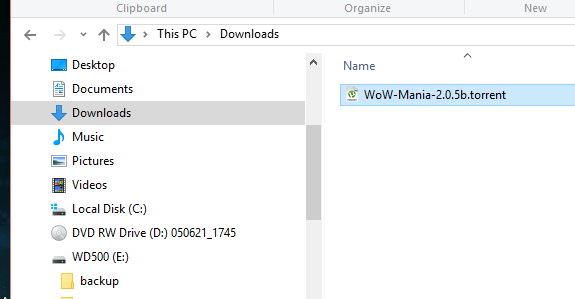 Now that the download is done, you will have a folder in your download folder called "WoW-Mania" (or similar). Copy this whole folder to a convenient location (In this guide I will suggest we move it to the root of your drive (ex. : C:\). Yes, I told you to copy that huge folder, instead of move. If you ever make a mistake in the process, you won't have to re-download it when you need to start over. 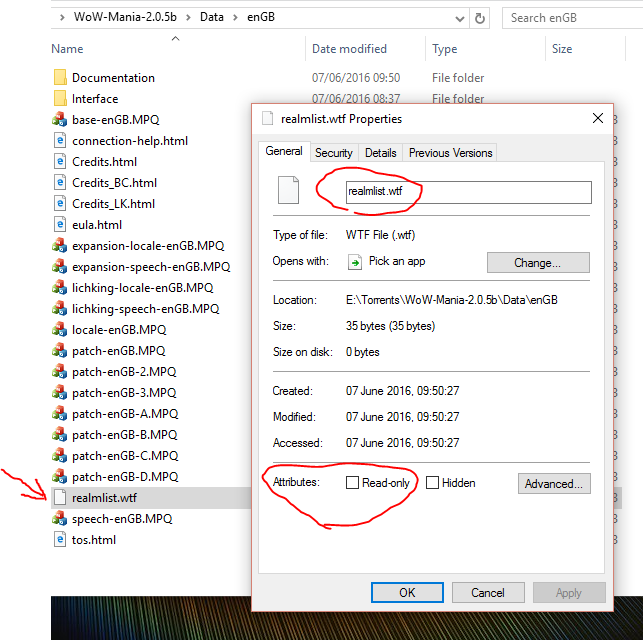 Moving the folder is important as Windows will not allow any application running in the Downloads folder to download or modify files. Now your game is in place! 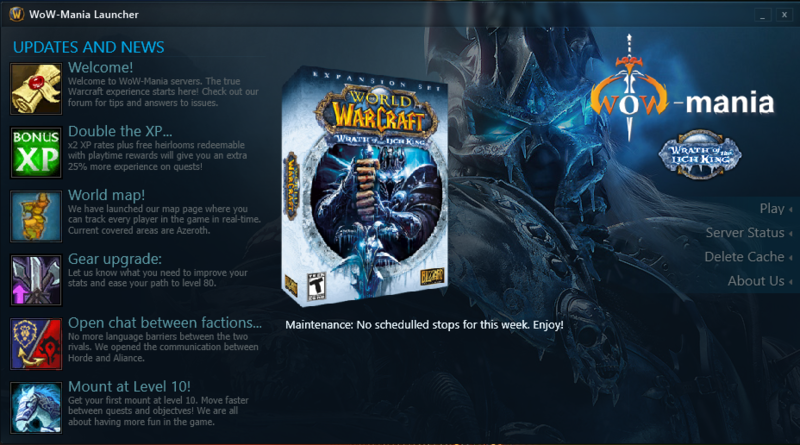 WOW-MANIA uses a custom Launcher to provide you with the latest patches and custom content. It is included in the latest Client Download (which you should have). 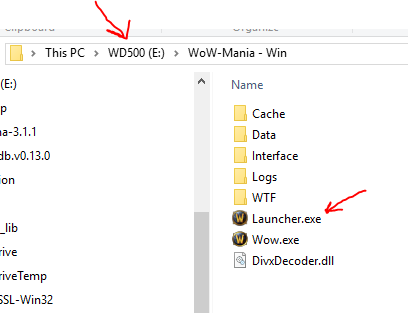 MAC USERS: The Wow-Mania Launcher does NOT work for MAC. Mac users should patch their game manually. This can be done by downloading the patch files here! The hardest part is now behind you and you're almost ready to play! It's important that the game folder doesn't have the folder permissions set to "read-only". Look for the Folder with the name "WoW-Mania-2.2.1" (or the name you have specified earlier) and navigate to the Data\enGB sub-directory. Right-click on the icon for the file "realmlist.wtf", and choose "Properties"
Now you have to make sure that "Read only" is unchecked. Hit "Apply" and you are done. Do the same for the entire WoW folder. To play the game at this point you'll have to go into your games folder every single time. You don't want that. You will need a convenient link on your desktop. But I will cover how to add a shortcut to your desktop. Here you can see the launcher in your game folder. This is the file that needs to be run to play the game. 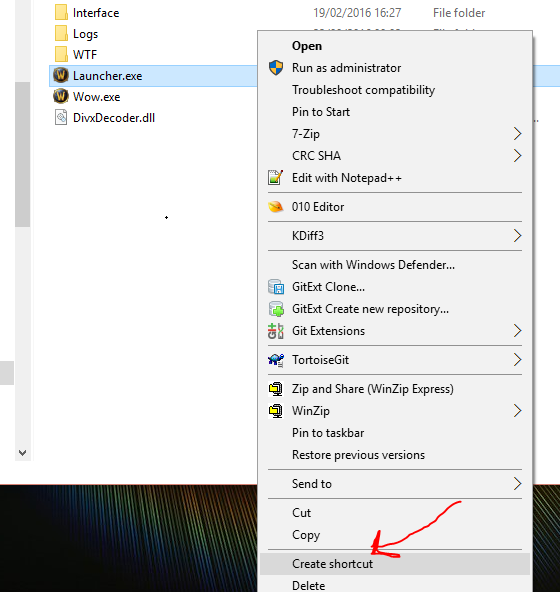 To make a shortcut on the desktop you'll only have to right-click that one file. Another list pops up and there you choose "Desktop (create shortcut)"
Now you can click the shortcut on your desktop and the Launcher will start. Sit back and relax... get yourself something to drink while the launcher downloads the patch files if there are any. You will need those to see all the WOW-MANIA custom content. It also contains other data, necessary to have the best WOW-MANIA experience. Now you can click the "PLAY" button on the right... and the game will start! 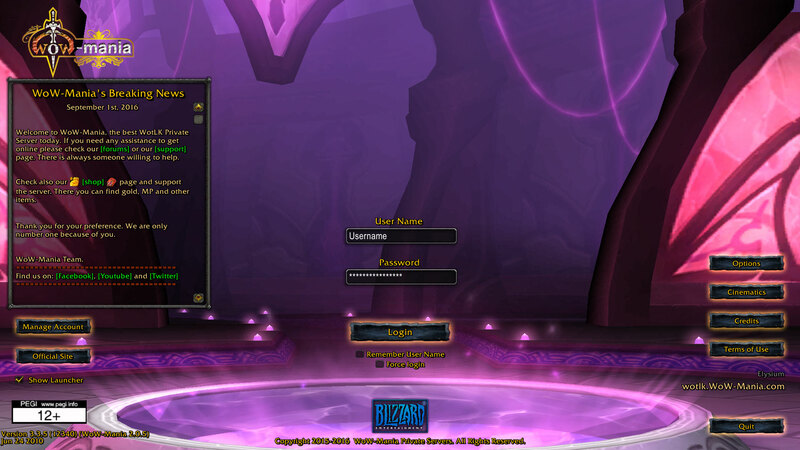 When the game starts, the first screen you'll see is the login screen. This is where you fill in the username and password you chosen at the first step of this guide. Now you are ready to go! Click "Login" and you can start creating your character! This guide is in constant update to reflect changes in the game, application and procedures. If you find that any part of it is out-of-date or incorrect please let us know.